I don’t know if you have missed me. I have missed writing the blog. It has been several days since I put up a new post and I feel badly about it. I like writing this blog. Love it, if the truth be told. I get a tremendous release from writing about my thoughts and emotions as I travel along on this Journey of mine. When I don’t write for a few days I feel less motivated, less focused, more susceptible to the lure of temptations and I feel just a just, well, out of touch. Ai haven’t been writing this week because plainly put, I am exhausted. I have been very busy this week and getting home very late. I have also been in the interview process for what I hope will be a great new opportunity for me. All of this has left me physically and mentally exhausted. Coming home and plotzing in front of the TV is not really my style but this week I have had little energy left for much else. This weekend will serve the purpose of rejuvenating me (I hope). I also will sit down and write a blog post every night as I had for so long. It may just be a quick hello or it may be a long venting but I will be there. The weather has finally shown promise of shaking off the chill of winter and taking on the cloak of sunny and warm spring afternoons. This has allowed me to shift my focus from hikes to rides. Tomorrow will be a very busy day. Up early to make the weekly whole wheat breads for the family and then a mid day ride of about 30 miles or so. Then that afternoon a dear friend is joining us for dinner. The best part of tomorrow will be breakfast. The Younger One is making breakfast for Missus and me! I can’t wait. The Younger is 12, 13 this summer, and he can cook two things: Scrambled eggs and French Toast. He makes them both well. He is taking the last of last week’s breads and making French Toast for his Mom and Dad. Pretty cool huh? I do not normally have French Toast but this is an opportunity to good to pass up. He simply announced to Mom early this week that he wanted to make breakfast for us on Saturday. No reason, no holiday, birthday, artificial event. Just wants to do it for Mom and Dad. It was known as The State Theater when we were children. Sunday will be an interesting day as well. The morning will find me on a 25 mile ride with the Local Bike Shop and then that afternoon we are meeting with a few friends to see the original King Kong movie at the local theater. 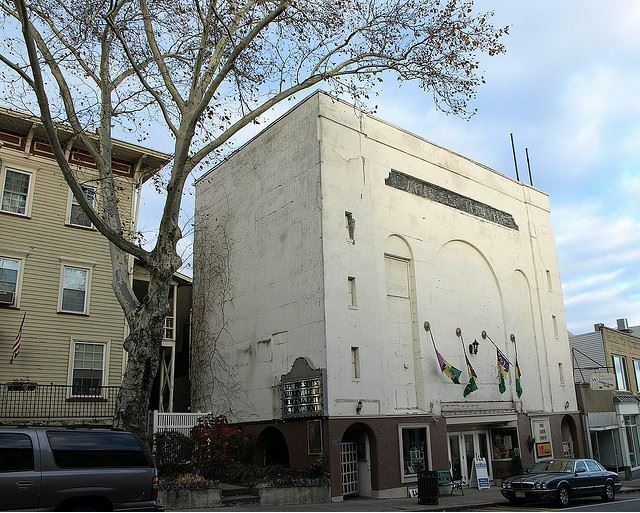 The Darress Theater in Boonton NJ has been around since the 19-teens and is the last theater of its type known to exist in the United States. You enter the theater from under the stage, facing the audience. I first went to this theater when I was a boy of five or six and spent many weekends watching the matinée. I have not been in the theater in the last 30 years I would guess. This should be a great deal of fun. Afterwards we are off to dinner at an as yet undetermined location. If all goes well, this will be exactly the type of weekend I need to refill my tanks and reenergize my spirit. 50 miles on the bike, dinners and a movie with good friends. One of the factors contributing to and in part caused by my exhaustion is insomnia. I have fought with insomnia since I was a boy. I can remember fighting it as young as six or seven years old. It is a brutal cycle. Mental exhaustion leads to insomnia which leads to physical exhaustion which perpetuates the mental exhaustion which leads to insomnia which leads to physical exhaustion which perpetuates the mental exhaustion which leads to insomnia which leads to physical exhaustion which perpetuates the mental exhaustion…. I will ride tomorrow even if I do not sleep well. I hope that the physical activity will help. As they say about Chicken Soup: It couldn’t hurt. On the food and weight side of life, I am still below 205 pounds and I am sliding further and further towards a vegetarian diet. We have had a bit of fish recently and I had a little tuna with lunch today but the inclusion of fish has become the rare thing rather than the exclusion. Mostly we serve fish when we have company…. I am really pleased with my weight. I pledged to myself that I would hit cycling season at or below 205 pounds and I have done that. Now I have to take the fitness I have built/maintained with the winter of hiking and convert it to fitness for cycling. The cycling muscles are in for a rude awakening over the next few weeks as I push on to get in cycling shape. Last week I realized that I have a long way to go on that front. Though I had no trouble doing the 22 mile ride in terms of finishing strong and ready to go another 10 miles if the ride had been that long, I did have to walk a hill and I loathe walking hills when I am cycling. Granted, it is a very steep hill but I had no trouble walking it even in cycling shoes and I would have thought nothing of it on a hike. It reinforces in my mind just how differently the body responds to different forms of activity. I can cycle 30+ miles, 50 miles, more but I had to walk a hill, and I can do ten, twelve-mile hikes, even up steep hills, without issue. I can’t run more than two miles without my lungs and legs threatening me with divorce. And while I can ride and hike, hitting that hill on my bike made my legs feel like dead weight. Seems we caught up with each at a mutually good time. I wish you well. Thank you for sharing that great photo of the old State Theater. Wow! A million and one memories surround that place for me. The weather is warm down here in Florida, but I find myself getting more and more homesick for North Jersey these days. You’re a good man Mark. You’ve touched many people’s lives with your blog.